Want to hear another surprising fact? 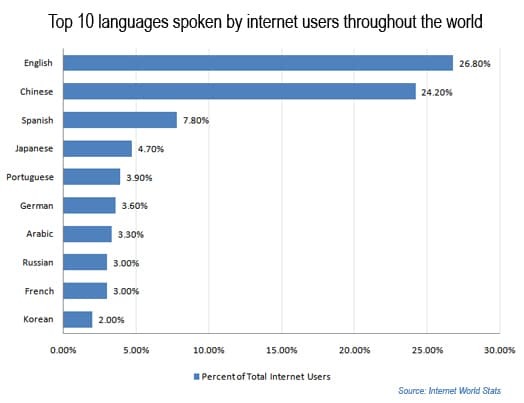 Only 26.8% of web users speak English. 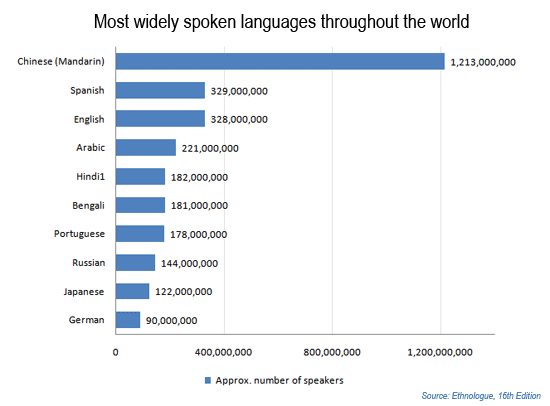 While it currently is the most popular language online, it only reaches slightly more than one quarter of all web users. They believe that more people speak English than actually do. They underestimate the importance of language in a purchasing decision. 56% said the ability to obtain info in their own language was more important than price. 75% of non-English speaking people said they will rarely, if ever, buy from an English-only website. You might write that off as only applying to B2C companies. I don’t think that’s accurate. It doesn’t matter if your company reaches businesses or consumers, language plays a huge role in purchasing. Would your company buy from, or partner with another company if there’s a huge language barrier? Of course not. If you want to reach an international audience, but aren’t approaching them in their own language, you have little chance of succeeding. If you would like to reach an international audience, and need to translate your web apps, let us know. We’ve recently developed a way to nearly automate web app translation. Just fill out this form to learn more or see a demo.